As at 1 December, the total pig herd in Northern Ireland stood at 631,100 head. This is 18% higher than in December 2016, and continues the growth seen in the June survey, according to provisional results from the Department of Agriculture, Environment and Rural Affairs (DAERA). 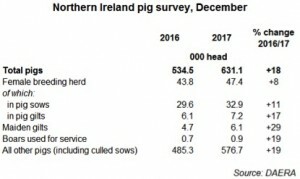 This growth was mainly a result of growth in the number of fattening pigs (up 19%), which included pigs imported to Northern Ireland for finishing. The number of female breeding pigs was also higher, at 47,400 head, an increase of 8% compared with the previous year. Total pig numbers in December were at the highest year-end level observed since 1985, and would again suggest a remarkable level of confidence in the sector, despite recently declining farmgate prices. Furthermore, based on the results of the latest census, it is likely that the gradual increase in the size of the NI pig herd will continue.